Today review is on another back shaving handle that you attach your own razor too, as this is just the handle to hold a razor. Enter the UltraFlexx Contour Body Shaving Handle. I am eager as always, to review different and multipurpose shavers. Anything that can be used on the back. 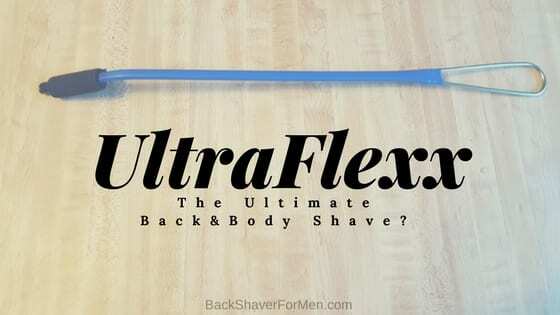 What Is UltraFlexx Contour Body Shaving Handle? What is the UltraFlexx? Well, the UltraFlexx is a multipurpose body shaving handle designed to attach just about any known existing razor out there too. This is made mainly out of pliable stainless steel that can be easily bent to whatever angle you would want. This could be a good option for people not wanting to buy another razor system and stick to what they normally use for either face of legs. That being said there are many reasons not just shaving your back this type of shaver handle is good for. 1 – Instructions on packaging. The main portion of the handle is made out of round stock stainless steel bent to form a handle with plastic covering most the length of the handle. Then the end of the handle, where the razor is attached has an elastic band that is 2 inches wide and 6 1/2 inches long with Velcro at the end to fold upon itself. You can get about three wraps around any razor to securely attach it to the handle. The length of the UltraFlexx is 18″ long, at its narrowness it is 5/16″ wide to its widest portion of the handle 1 1/4 inches wide. The stainless steel is malleable to a point, it can be bent then re-bent or straightened. Avoid over bending the handle or bending it fast. In general, the handle is pretty lightweight and won’t be breaking your wrist with an outrageous weight to swing around your back. The performance aspect depends only on fewer factors as this back shaver is essentially only a handle with no razor sold with this product. But there are very important aspects of the performance and design of this product from those aspects alone. For example reach, ability to hold a razor, and comfortableness of the handle, this and much more. As far as the ability to reach most of your back the UltraFlexx comfortably can get to areas and is highly adjustable. You can straighten to get more length out of it or bend it to get the right angle for the upper back. The length is adequate and works okay. Getting the right angle for the razor might take some initial bending, from my personal experience. As I had to keep bending it to find the most optimal bend for the razor to correctly shave my back. But once you find it you’ll know it. Once the razor is attached it indexing well, that meaning you know where the razor is pretty intuitively. As you are not fighting to find the right angle all the time, it just is there. It holds the razor with the elastic band and Velcro nicely. There is zero movement up and down and a lot of side to side movement, but it doesn’t affect the shaving experience. I would have thought it would have moved out of place while shaving but I did not experience this. It completely locks down the razor when properly attached. The handle is not the most comfortable as it kind of digs into my hand after just a few minutes, nor does it stabilizes in my hand 100%. As well you cannot really choke up on it for the handle within the middle is quite thin and you are not able to effectively hold it. Will accept ANY razor, disposable or reusable on the market today. Worry not, about this not working with your razor. Once bent it holds its form until rebent. Good indexing when using it. As once the razor is attached you know where the razor blade is, and don’t have to adjust unnecessarily. When a razor is secured, little to no up and down movement. There is a quite a bit side to side movement, but this generally doesn’t affect the shave, at least it didn’t for me. Comes with a lifetime guarantee. What? Yeppers! Decent length on the handle should handle just about any back. Made of stainless steel. So, it won’t rust on you and should provide a lifetime of use. Nothing really to break on this. Can be used in or out of the shower. It will not rust on you. Owner claims it is designed to be used specifically in the shower. Manufactured in the good old USA. Props!!! Comes in two colors, you-all. Blue for the gents and red of course, for da ladies. Opening at the bottom end of the handle can be easily hung in the shower and out of the way. Positioning the handle over the top of my back gives a really good angle for attack. It just feels good and performs well in this matter. Multipurpose handle for back, legs, or whatever you have trouble reaching design. I think I got my wife hooked on shaving her legs with this type razor extender handle. Instructions are sent as well. Love seeing instructions that provide information for properly using any product included with the item. A little bit of a learning curve to effectively use this shaver handle. As finding the right angle can take a few minutes for certain body areas. 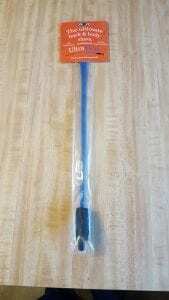 Hard to grip upon, as the handle becomes very thin shortly after the end of the handle. Kind of unwieldy, when choking up on it, but not impossible. Might be hard for older people or people with hand injuries to properly attach the razor to this handle. Bottom of the handle is not the most comfortable handle either, though not bad, it slightly digs into my hand when firmly gripped. When wet the bottom of the handle is slippery. Needs improvement. Packaging is hard to get off with the number of staples than the tape. As I didn’t want to destroy the instructions that came along with the Ultraflexx. 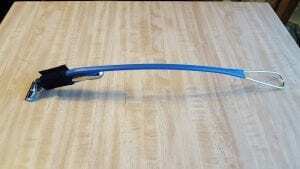 Hard to bend the handle, as it is adjustable and meant to be bent into whatever position you desire. Some people might struggle with it. The website was hard to find, it was not until I received the product with the actual website address for this. The address is shaveultraflexx.com. As far as back shaving is concerned, limited to the width of a standard beard shaver, which is about 1 1/2″ wide. This will take awhile to shave your back with and not as effective as some of the wider razor I have reviewed. Especially for really hairy backs. For a good break down on my top three shavers head on over to, What Is The Best Back Shaver? As with any back shaving adventure, it is always helpful to use a mirror or a double mirror to help with getting the right angle as well as making sure you did a complete job. Not spotty. Don’t be afraid to bend it to get the right angle so the razor will shave. Once you find it, it will become obvious. As far as bending it, use a countertop of something solid to help get the correct bend in the UltraFlexx. When putting on a razor you can either put it on top or the bottom of the shaver experiment to find what works best for your particular razor. When bending the handle bend slowly and smoothly to avoid kinking the handle. Keep hands away from the business end of the razor when attaching the razor to the handle. As it could spin and nick you. Well, I love the flexibility of being able to bend this any way you would like. 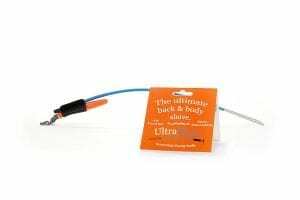 The securing method really works well, as it firmly locks down the razor, and you would be hard-pressed to find a razor that doesn’t work with the UltraFlexx. Is simple design is effective and is multipurpose as well. Great for shaving legs for women, or for anyone with mobility problems. It’s relatively cheap, but for about $10.00 more dollars you can buy the best back shaver found here, What is baKblade? As a back shaver it middle of the road, as you are stuck using a standard beard razor width on a such a large area of the back it takes a while. That is unless you use the Razorba G.O.A.T. 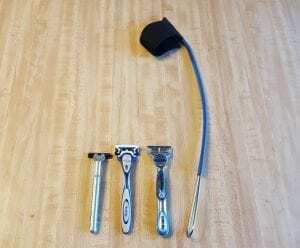 shaver, you can read my full review of this wide razor that can be used in conjunction with the UltraFlexx here, Razorba GOAT Wide Disposable Double Razor Review. It is versatile in that it can be used on other parts of the body as well. Especially the legs, or people with mobility problems. It’s decent, with room for improvement. Great for someone not looking to buy a different set of razors and use the razor he already using. The UltraFlexx works but it is by far not the best way to shave your back. Couldn’t test performance as it comes with no razor. Couldn’t test Ability Not to clog. Handle was not that comfortable. This shaver indexed well when shaving the back. Any questions or comments please post below. Thanks!